Rakam (middle) with Jamili (left), Ahemad (second left), Franca (second right) and Jens at the Sulu-Sulawesi Seascape Project Regional and National Closing Event. KOTA KINABALU: Sabah has benefitted tremendously from the Sulu-Sulawesi Seascape Project. Agriculture and Food Industry Minister Junz Wong described the initiative, which was a Coral Triangle (CTI) project jointly implemented by partners from Malaysia, Indonesia and the Philippines as an avenue to provide opportunities for regional learning exchanges. “The Seascape model provides guidance for the Coral Triangle countries in establishing and managing large marine, trans-boundary ecosystems such as seascapes,” Junz said in his speech read by his political secretary Rakam Sijim at the Sulu-Sulawesi Seascape Project Regional and National Closing Event on Thursday. He pointed out the project had also given a positive impact on the preservation of the Tun Mustapha Park (TMP), which was established on May 19, 2016 and is also the largest marine park in Malaysia, covering 898,762.76 hectares. “The Integrated Management Plan of the TMP is focused on bringing together relevant stakeholders to manage the park. With the support of the Sulu Sulawesi Seascape Project, Sabah Parks had implemented several preparatory activities working towards the establishment of a collaborative approach to manage the TMP. “One of the key achievements is the formation of a multi-agency enforcement committee called the Tun Mustapha Park Collaborative Enforcement Committee (TMP-CEC),” he added. He pointed out that Sabah shares many valuable resources in the Sulu-Sulawesi seas, particularly the species that are migratory or fish stocks that straddle the state’s borders such as groupers, tunas and small pelagic. Designated as a priority seascape under the Coral Triangle Initiative on Coral Reef Fisheries and Food Security (CTI-CFF) by the six member countries (Indonesia, Malaysia, the Philippines, Papua New Guinea, Solomon Islands and Timor-Leste), the Sulu-Sulawesi Seascape serves as a geographic focus of investments, actions, conservation and climate change related results under the CTI-CFF Regional Plan of Action (RPOA). 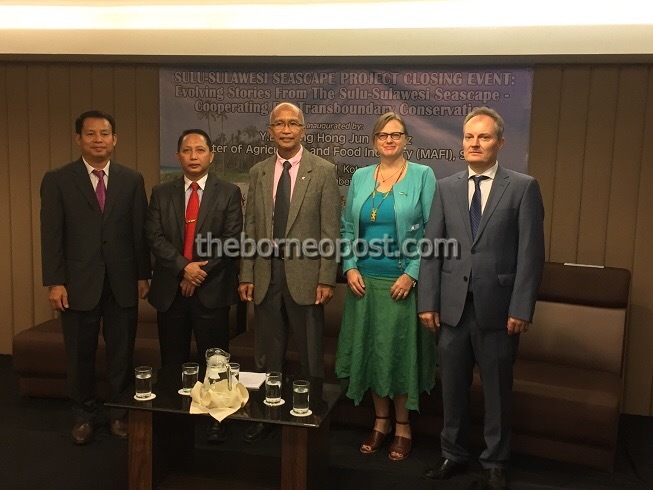 Among those present in the event were Sulu-Sulawesi Project director Franca Sprong, the Economic Councillor to the German Embassy of Kuala Lumpur Jens Brinckmann, Sabah Parks director Dr Jamili Nais and Sabah Fisheries Department director Dr Ahemad Sade.